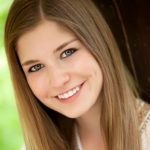 This guest post was written by Catherine Clark, a second-year graduate student at Northern Arizona University. She uses speckle imaging and long-baseline interferometry to characterize exoplanet host stars. When she’s not Fourier transforming, she enjoys yoga, climbing, and photography. The authors of today’s paper are particularly interested in how long-period gas giants, or Jupiter analogs, disrupt planet formation close to the host star. In particular, the authors are interested in exoplanetary systems containing both Jupiter analogs and super-Earths, or planets with masses larger than Earth’s, but significantly less than that of Uranus or Neptune (see Figure 1). In today’s paper, the authors use radial velocity (RV) observations to search for such systems. It is difficult to constrain the effect that Jupiter analogs have on inner planetary system evolution. Transit and radial velocity surveys require the observation of one or more complete orbits of these planets, and current surveys have not been around long enough to observe the whole orbit of Jupiter analogs in exoplanetary systems. 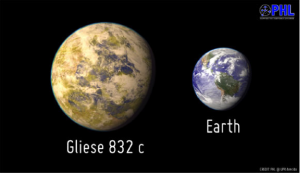 In order to combat this lack of observational constraints, the authors collect published RV data for 65 systems each having at least one confirmed super-Earth. Those systems are where the researchers believe they will find the Jupiter analogs they are hunting for. Here the authors define a super-Earth as a planet with a radius of 1-4 Earth radii, and a mass of 1-10 Earth masses. A Jupiter analog has a mass of 0.5-20 Jupiter masses, and a semi-major axis of 1-20 AU. Within the sample of 65 systems, the authors were able to recognize Jupiter analogs by analyzing long term trends in the RV data. The researchers then obtain adaptive optics (AO) imaging data to search for companions to the system’s host star, as companion stars could cause RV trends that the researchers might misattribute to Jupiter analogs. The authors then determine whether the measured RV trends exhibit a correlation with the star’s emission lines to see whether any of the observed trends are due to stellar activity. Finally, the researchers then account for uncertainty introduced by the inability to pinpoint the precise locations of the Jupiter analogs. Figure 2. 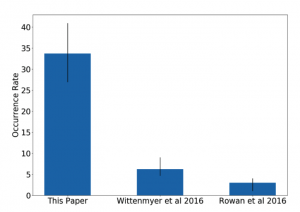 The Jupiter analog occurrence rate found in this paper as compared with the rate estimates published in Wittenmyer et al. (2016) and Rowan et al. (2016). This study finds a much higher occurrence rate of long-period gas giants in systems hosting inner super-Earths than would be expected by chance alone. After performing this analysis, the authors find nine systems with statistically significant trends indicating the presence of a Jupiter analog. They find that in systems hosting inner super-Earths, the occurrence rate of Jupiter analogs is 39±7%, which is a significantly higher rate than one would expect to see by chance alone (see Figure 2). 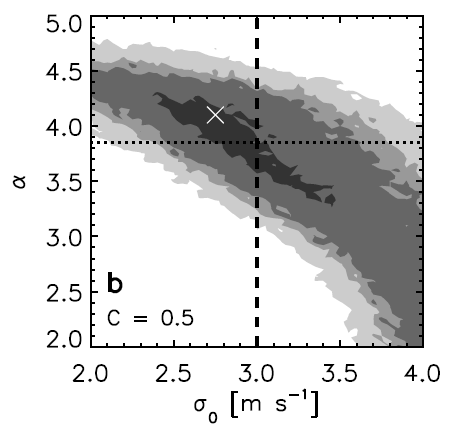 The authors also find an occurrence rate of 44±17% for systems with an M-type host star, which are the smallest type of stars. 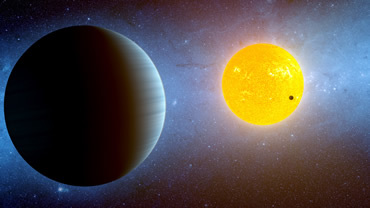 This indicates that a system having a host star of a different spectral type does not alter the Jupiter analog occurrence rate in systems hosting an inner super-Earth. The apparent correlation between the occurrence of inner super-Earths and outer Jupiter analogs suggests that long-period gas giants do not hinder super-Earth formation by any of the processes previously mentioned. Conversely, it seems as though these two population of planets seem to be correlated with one another, and as though outer gas giants may even facilitate super-Earth formation. This is an intriguing result, because it implies that systems with long-period gas giants identified in RV surveys likely contain an inner super-Earth as well, providing a compelling place to continue the search for these mid-sized planets. We have a lot to learn about how exoplanetary systems form, but observing and understanding correlations like the one found in this study help researchers understand what to expect in the wealth of exoplanetary systems we now know exist.